Extensive invasive cervical resorption (ICR) defects involving the cementoenamel junction has a poor periodontal, restorative, and structural prognosis. However, some patients may insist upon surgical restorative repair of these lesions. Two such treated cases are reported with 15 and 12 month follow–up, respectively. In one case, glass ionomer cement, and in the other case, composite resin with fiber post, were used for restoration, after thorough surgical debridement. Both the patients were available for close follow-ups and maintained scrupulous oral hygiene. In both cases, the teeth had poor prognosis due to high chance of tooth fracture and possible continued periodontal breakdown with bone loss. However, at the above-stated follow-up periods, the teeth remained asymptomatic, periodontally stable, and structurally intact. This supports that a surgical restorative treatment, of the extensive ICR lesion, may result in short-term success and tooth retention. Extensive invasive cervical resorption (ICR) is a lesion, with a hopeless prognosis., The involved tooth is doomed for extraction and needs to be replaced by an implant, bridge, or an Removable Partial Denture (RPD), as per the case factors. 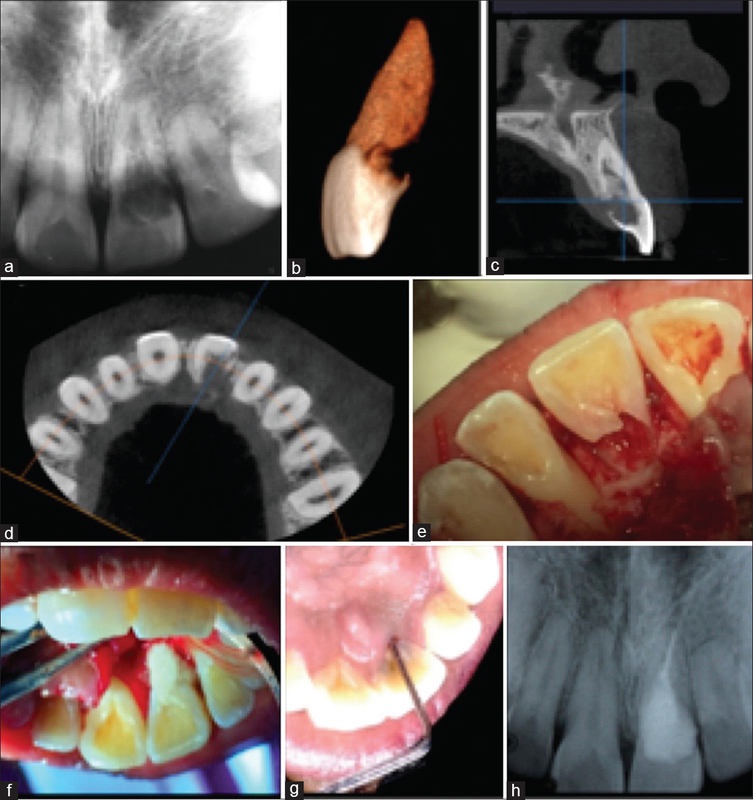 The reason for this prognosis is extensive structural weakening, questionable periodontal prognosis, and the possibility of continued resorption. ICR lesions usually start just below the cementoenamel junction (CEJ), on the lateral aspect of root and have a moth-eaten appearance. In extensive resorption defects, it becomes difficult to determine, whether it is an internal (IR) or an external root resorption. Nevertheless, the treatment strategy, for either diagnosis, remains the same. Radiographically, an IR resorptive defect is usually smooth and symmetrical, with a homogenous density. Typically, the pulp canal space outline cannot be traced within the lesion, as the pulp canal space balloons out. ICR, on the other hand, usually tends to be ill defined, asymmetrical, and nonhomogeneous in density. Furthermore, in ICR lesions, typically, the pulp canal space can be seen running through the lesion. An extensive cervical invasive lesion, with destruction of the CEJ, apart from defect accessibility and restorative issues, poses an additional problem of open communication with the gingival sulcus. Few cases are reported with the follow-up of the surgical restorative treatment of the ICR defect opening into the sulcus.,,, We report two such treated cases here. A 33-year-old female periodontist reported to the Department of Conservative Dentistry and Endodontics for consultation, regarding the tooth #9. Chief complaint was resorption observed in the intraoral periapical (IOPA) of upper central incisor #9 [Figure 1]a. The tooth had normal lustre and color was nontender to palpation and percussion. There was bleeding on probing, with a pocket depth of 8 mm on the distopalatal aspect of #9. On probing for possible etiological factors, patient gave a history of orthodontic treatment 10 years ago and a pregnancy 4 years back, respectively. There was no history of traumatic injury to the orofacial area, use of bisphosphonates, or hormonal therapy. On the IOPA radiograph, an extensive radiolucency was observed in the cervical third of the crown, extending vertically till the junction of middle and apical third of the root. It could be seen perforating on the distal aspect of the tooth, at the CEJ area. In the cervical and middle third of the root, calicifications within this radiolucency could be observed. The root canal was seen to pass through the radiolucency. No periapical lesion was noted. A tentative diagnosis of Class 4 ICR with ectopic calcifications was made. Patient was informed of the poor prognosis of the tooth and was advised to consult with the Department of Implantology regarding implant replacement of tooth #9 postextraction. The patient, being a periodontist, understood the poor prognosis of the surgical endodontic treatment, as well as the impact of such treatment on future implant placement. However, the patient still demanded conservative treatment for the tooth, on their own risk, with regular follow-ups, to early detect failure. Cone-beam computed tomography (CBCT) was advised to assess the case in detail. On CBCT, the tooth was seen to be coronally hollowed out, with extensive resorption till the middle third of the root. The apical extent of the resorption seemed to be containing linear calcifications. The resorption was seen to perforate distopalatally. Bone was seen to enter the canal at the apical extent of the perforation [Figure 1]b, [Figure 1]c, [Figure 1]d. Oral surgery and oral medicine consultants were consulted, and on patients' demand, they advised close recalls and implant placement on noticing early signs of failure of conservative treatment. Patient was again apprised of the high chances of tooth fracture, as well as poor prognosis of treatment. Patient still opted for the conservative treatment. Due to the extensive nature of defect and calicifications present, a surgical treatment was planned. Use of mineral trioxide aggregate (MTA) for defect restoration was ruled out, due to difficulty in shaping it into a root form, and because of expected sulcular exposure of material. It was decided to use conventional glass ionomer cement (GIC) for the defect restoration. For accessing the lesion, a mucoperiosteal envelope flap was raised. The flap was sutured to a tooth on the contralateral arch for ease of reflection. There was little granulation tissue, which was removed with the help of a small spoon excavator [Figure 1]e. Once the tissue was removed, the palatal cortical bone was observed to be extending within and filling the root canal. A small round carbide was used to remove bone from canal as well as from over the palatally perforated root. The root was debrided till all bleeding points and soft tissue were eliminated. A common finding with ICR lesions is the finger-like extensions. One such identified extension on CBCT was included into the canal during bone morphogenetic protein. The entire periphery of the perforated root part was made free of bone and exposed. Hand files were used further to debride the root. The canal was completely cleaned, shaped, and obturated sectionally in the apical third. After thorough debridement, the defect was primed with GIC liquid for 10 s, before placement of GIC into the defect. Care was taken to conform GIC to the shape of the root and keep it within the confines of the root outline [Figure 1]f.
A periodontist assessed the feasibility for periodontal regeneration clinically. However, owing to the nature of defect (no containability or vascularity), periodontal regeneration was ruled out. The surgical site was inspected for any debris, it was thoroughly cleaned, and the flap was positioned back and sutured. A periodontal pack was placed. After 4 days, the pack and sutures were removed. Patient was told to avoid heavy biting loads onto the tooth. Patient was placed on chlorhexidine mouthwash use for a month. The patient was recalled and assessed at 1, 3, 6, 9, 12, and 15 months. At all times, the surgical site looked completely healthy, and the patient was asymptomatic. Periodontal probing was done at 3 months and all the subsequent recalls. Periodontal probing revealed normal probing depths at all sites on tooth #9, during all recalls. The 15th month probing [Figure 1]g and IOPA radiograph [Figure 1]h demonstrate the successful outcome. A 27-year-old female, a human resource department personnel of the dental college, reported to the Department of Conservative Dentistry and Endodontics, with a chief complaint of pus discharge and slight pain in upper right central incisor. The patient gave a history of traumatic injury 5 years back. At the time of trauma, both the upper central incisors and face received a blow from a fall onto a stone. Immediate attention was given to upper left central incisor. Endodontic therapy was done for tooth #8, followed by Porcelain Fused Metal (PFM) crown. Tooth #8 was not treated and patient was asked to report for a follow-up, for which she failed to report. There was no relevant medical history, and clinical examination revealed a significantly discolored maxillary right central incisor with sinus tract over the apicolabial aspect of tooth #8. Gutta percha tracing pointed to the apical area of tooth #8. The said tooth was slightly tender to percussion but showed no mobility. Palatal aspect of the tooth showed pink hue and explorer detected a broken external surface in the subgingival area [Figure 2]a. Bleeding on probing was present on the mesial and palatal aspects of the tooth. Periodontal probing revealed a pocket of 8 mm on mesiopalatal aspect of tooth #8. The periapical radiograph showed extensive Class 3 ICR lesion which was confirmed by CBCT [Figure 2]b. CBCT revealed the mesiopalatal perforation of the lesion along with CEJ involvement [Figure 2]c. This patient too like the previous patient was informed of the very poor prognosis of restorative attempt and its impact on future implant placements. The patient was referred for consultation with the implantologist. However, the patient returned, insisting on conservative treatment of the tooth, based on close follow-ups and early detection of failure. Tooth #8 was nonvital. Its root canal system was accessed, cleaned, and shaped. The canal was dressed with calcium hydroxide for a week and thereafter obturated with gutta percha cones and bioceramic sealer (iRoot SP, IBC, Canada). Within 2 days after conventional root canal therapy, surgery was performed. Under local infiltration, full thickness mucoperiosteal flap from canine to canine was elevated. The exposed surgical site revealed the perforation in mesiopalatal area in the cervical region, just above cingulum, extending up to middle one-third of the root [Figure 2]d. The resorptive tissue was leathery in consistency. Spoon excavators and round carbide burs were used for defect curettage. To avoid contamination from blood, bone wax was applied onto the bone. Fiber post (Reforpost, Angelus, Brazil) was cemented using flowable composite. The defect was restored with a nanohybrid composite (Filtek Z250XT, 3M, ESPE). Contouring was done, to keep the restorative material within the root periphery [Figure 2]e. Periodontal regeneration was again ruled out for this defect by the periodontist, based on the lack of containability and vascularity of the defect. After removing bone wax and irrigating the entire area with 50% betadine-saline irrigation, flap was replaced and sutured. An IOPA was made [Figure 2]f. A periodontal pack was given. Patient was advised chlorhexidine mouthwash. The pack and sutures were removed after 5 days. Patient was advised to avoid heavy biting from the treated tooth. Patient was recalled at 1, 3, 6, 9, and 12 months. At all times, tooth was clinically asymptomatic, with normal probing depths and IOPA radiograph depicted healing. 1 year recall probing picture [Figure 2]g and IOPA [Figure 2]h depict clinical and radiographic signs of healing. Both our cases were females, just entering the third decade of their life. The possible etiological factors that could be gleaned from their respective histories were orthodontic treatment and trauma to tooth respectively. The greater affliction of young females is reported in the literature. Trauma and orthodontic treatment are also the oft-cited reasons for ICR. CBCT is known to be an excellent tool for diagnosis, treatment planning, and prognostic assessment of root resorptive lesions. CBCT can determine the type of resorption, extent of resorption, perforating sites on root, the extent of bone loss, periapical pathology, and tooth restorability. CBCT was very helpful with these regards for both our cases. A Cochrane systematic review reported the lack of evidence for the right treatment of ICR. However, they recommended that decision-making for treatment should be based on combination of clinician's experience and the patients preferences, where appropriate. Both of our cases had teeth doomed for extraction. Moreover, retaining the involved teeth posed an additional danger of bone loss and therefore a poor implant prognosis as well. However, both patients had good dental awareness (one patient was a periodontist and the other worked at the dental college). Both patients were adamant about retaining their natural tooth and were available for close follow-ups. Hence, a surgical root repair was planned for both cases. Although MTA is a promising root repair material, in our cases, MTA could not be used due to impossible to contour it to root form, it's rough surface promotes plaque formation will not reinforce the root, can be scraped during scaling procedures, and causes tooth discoloration. The restorative material used for root restoration should be biocompatible, have a matching coefficient of thermal expansion (COTE), and provide root reinforcement. We used conventional Type II GIC (GC, Japan) for our first case. GIC chemically adheres to tooth structure, is biocompatible once set, has matching COTE to tooth, is antimicrobial, and provides root reinforcement.,, Furthermore, it has better handling characteristics and biocompatibility than resin-modified GIC. GIC has also been used successfully in cases such as palatogingival groove restorations. Composite resins, though, possessing all the needed requirements for root restoration, remain dependent on moisture control for success. Our second case enabled us sufficient moisture control for the use of composite resin restoration. Heithersay, in a review, stated the success rates of treatment of Class 3 ICR lesions as 77.8% and Class 4 ICR lesions as 12.5%. Among 16 teeth with Class 4 ICR lesion observed over 3–11 years, 50% tooth survival was noted; three teeth were lost due to periodontal pathosis, two due to root fracture, and three because of continued resorption with periapical disease. Another case report, of the surgical restoration of a Class 4 ICR lesion, demonstrated a 9.5-year survival. The tooth eventually had fractured but was periodontally and endodontally sound. Both our patients could have close recalls and followed the oral hygiene instructions meticulously. This could be a reason for the observed periodontal stability. The patients were also instructed to avoid the teeth for heavy biting. This supports that a surgical restorative treatment of the extensive cervical resorption lesion may result in short-term success and tooth retention. The authors deny any conflicts of interests related to this case report. Heithersay GS. Invasive cervical resorption following trauma. Aust Endod J 1999;25:79-85. Heithersay GS. Treatment of invasive cervical resorption: An analysis of results using topical application of trichloracetic acid, curettage, and restoration. Quintessence Int 1999;30:96-110. Soares AJ, Souza GA, Pereira AC, Vargas-Neto J, Zaia AA, Silva EJ, et al. Frequency of root resorption following trauma to permanent teeth. J Oral Sci 2015;57:73-8. Tronstad L. Root resorption – Etiology, terminology and clinical manifestations. Endod Dent Traumatol 1988;4:241-52. Trope M. Root resorption due to dental trauma. Endod Top 2002;1:79-100. Barker BC, Lockett BC. Histology of external and internal resorption. Aust Dent J 1977;22:360-70. Bergmans L, Cleynenbreugel JV, Verbeken E, Wevers M, Meerbeek BV, Lambrechts P. Cervical external root resorption in vital teeth. X-ray microfocustomographical and histopathological case study. J Clin Periodontol 2002;29:580-5. Patel S, Ricucci D, Durak C, Tay F. Internal root resorption: A review. J Endod 2010;36:1107-21. Hiremath H, Yakub SS, Metgud S, Bhagwat SV, Kulkarni S. Invasive cervical resorption: A case report. J Endod 2007;33:999-1003. Yilmaz HG, Kalender A, Cengiz E. Use of mineral trioxide aggregate in the treatment of invasive cervical resorption: A case report. J Endod 2010;36:160-3. Vinothkumar TS, Tamilselvi R, Kandaswamy D. Reverse sandwich restoration for the management of invasive cervical resorption: A case report. J Endod 2011;37:706-10. Liang H, Burkes EJ, Frederiksen NL. Multiple idiopathic cervical root resorption: Systematic review and report of four cases. Dentomaxillofac Radiol 2003;32:150-5. Patel S, Durack C, Abella F, Shemesh H, Roig M, Lemberg K, et al. Cone beam computed tomography in Endodontics – A review. Int Endod J 2015;48:3-15. Ahangari Z, Nasser M, Mahdian M, Fedorowicz Z, Marchesan MA. Interventions for the management of external root resorption. Cochrane Database Syst Rev 2010;(6):CD008003. Chang YC, Lin HJ, Lee YL, Liu LC, Jeng JH. Repairing invasive cervical root resorption by glass ionomer cement combined with mineral trioxide aggregate. J Dent Sci 2012;7:395-9. Ballal NV, Jothi V, Bhat KS, Bhat KM. 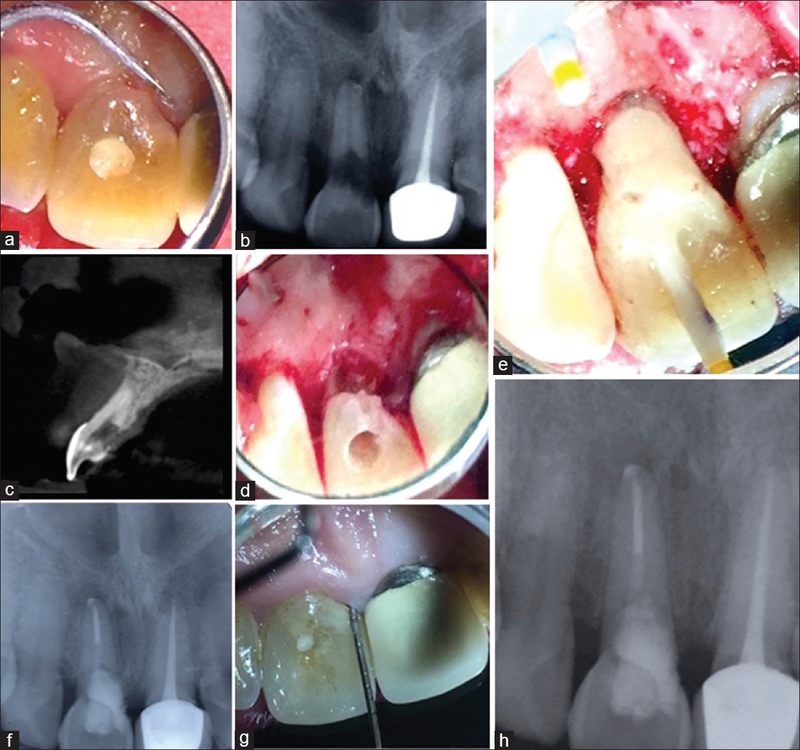 Salvaging a tooth with a deep palatogingival groove: An endo-perio treatment – A case report. Int Endod J 2007;40:808-17. Hommez GM, Browaeys HA, De Moor RJ. Surgical root restoration after external inflammatory root resorption: A case report. J Endod 2006;32:798-801. Schwartz RS, Robbins JW, Rindler E. Management of invasive cervical resorption: Observations from three private practices and a report of three cases. J Endod 2010;36:1721-30. Baratto-Filho F, Limongi O, Araújo Cde J, Neto MD, Maia SM, Santana D, et al. Treatment of invasive cervical resorption with MTA: Case report. Aust Endod J 2005;31:76-80.